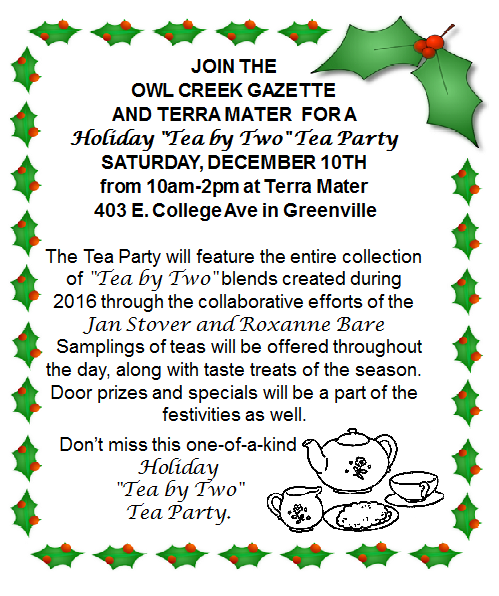 Owl Creek Gazette: You're All Invited to Our Holiday "Tea by Two" Tea Party! You're All Invited to Our Holiday "Tea by Two" Tea Party! 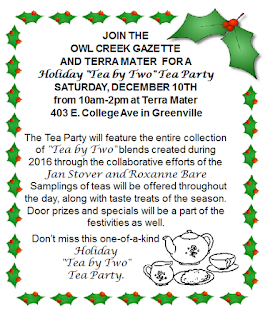 Our festive Holiday "Tea by Two" Tea Party will feature the entire collection of "Tea by Two" blends created throughout 2016 by the collaborative efforts of the Owl Creek Gazette and Terra Mater. Samplings of teas will be offered throughout the day, along with taste treats of the season. Door prizes and specials will be a part of the festivities as well.